d Blog (BBC), authored by Ben Henry, dates back to January, 2006 and features the whimsical reflections of an avid collector. 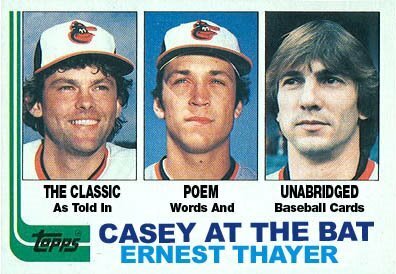 Henry's blog has long been a dedicated outlet for sharing his thoughts on a simple hobby, collecting baseball cards. It is clear that he is a throwback from another era when things like grading, insert ratios, design elements and autograph checklists didn't even exist or matter. To Henry, they still don't. Content to simply muse and opine on the nuances of 1980s mustache styles as much as the cards they are depicted on, Henry's satire and dry wit shine through. With collectors hungry for more media content, the response to BBC was, as Henry described it, “immediate and mostly positive." It was clear that regardless of where the subject matter came from, collectors wanted to read about their common trading card interests and Henry's blog provided that outlet. By the spring of 2006, mainstream media outlets had picked up on Henry's blog, garnering mentions on ESPN's Page 2 and in Entertainment Weekly later that summer. Henry's influence on collectors and future bloggers was evident. He pointed out, “I think it may have taken about a week or two after that really brief mention in EW for other collector blogs to start up." When asked what other blogs he likes and reads, Henry was specific, “I enjoy reading Stale Gum, Cardboard Junkie, and Cardboard Gods. I read each for its own reason. Stale Gum because Chris Harris is so thorough in his dissections of new sets, sets I have absolutely no interest in collecting. Cardboard Junkie because Dave posts so many great scans and photos of the cards he's interested in, and Cardboard Gods because Josh Wilker is one of the best writers out there." It's fair to say that The Baseball Card Blog helped launch the sports card blogsphere. And with so many blogs to choose from, many of which he doesn't read, Henry provided a poignant response to the question about what annoys him the most about other bloggers as a whole, “In general, [it] is the accepted practice of trolling. I just don't see the point." Trolling is the nitpicking negativity, condescending comments and abusive behavior afforded by the anonymity of the Internet on blogs, forums and social media outlets. Despite a year-long hiatus in 2009, BBC's “continued longevity can be attributed to Mike Kenny and Travis Peterson, the blog's (other) two talented contributors, and five years' worth of thorough search engine optimization." In what was envisioned as his retirement post, no other piece better summarizes the brilliance of Ben Henry than his ode to Casey at the Bat. Mine is a question. I’m just getting back to collecting. I’m having fun, but as I search through ebay, why are there such big variances for the same card? For example a rookie Jordan rated 10 can vary from $100k to $3k. Can you help? I’m sure there’s a good reason.